Hematopoietic stem cell transplantation is commonly used in patients with certain hematological or bone marrow tumors. Total body irradiation combined with chemotherapy is part of the preconditioning protocol that was the most commonly used before hematopoietic stem cell transplantation. However, total body irradiation preconditioning damages other normal cells in bone marrow. Therefore, exploring the mechanism of radiation resistance in bone marrow mesenchymal stem cells is of great significance for recovering the hematopoietic function after cell transplantation. This study aimed to demonstrate the miR-29b adsorption of circRNA_014511 and explore the effect of circRNA_014511 on radiosensitivity of bone marrow mesenchymal stem cells. In this study, circRNA_014511 overexpression vector was constructed and transfected into bone marrow mesenchymal stem cells, miR-29b-2-5p and P53 were found to be decreased, which could be reversed by miR29b-mimics. Dual luciferase reporter assay confirmed the binding of circRNA_014511 and mmu-miR-29b-2-5p. Flow cytometry analysis showed the apoptosis rate of bone marrow mesenchymal stem cells overexpressing circRNA_014511 was significantly decreased. In the circRNA_014511 transfection group, after cells were subjected to 6Gy irradiation, G2 phase arrest appeared, the expression of P21 and GADD45A was significantly decreased, and cyclin B1 was significantly increased. 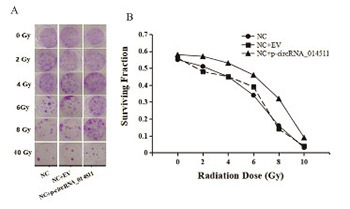 Colony formation assay showed the survival fraction of circRNA_014511 overexpression cells after irradiation was significantly higher than control group, and the radiosensitivity was decreased. In conclusion，our findings demonstrated that circRNA_014511 could inhibit the expression of P53 by binding miR-29b-2-5p, and decrease the radiosensitivity of bone marrow mesenchymal stem cells by affecting cell cycle and cell apoptosis.